It has been a while since I have sat down and written. With my new radio shows and my health as well as caring for our large pack of misfit mutts, there is not enough time in the day for writing. Besides some days I feel as If I am beating my head against a stone wall, because the domestic animal overpopulation crisis in North America continues to get worse. Go ahead, tell me it’s a myth, I apologize in advance for the necessity to laugh at those words as they come falling out of your face. No I am not being rude but I am being truthful. There IS a domestic animal overpopulation crisis, and the truth of the matter isn’t difficult to find. 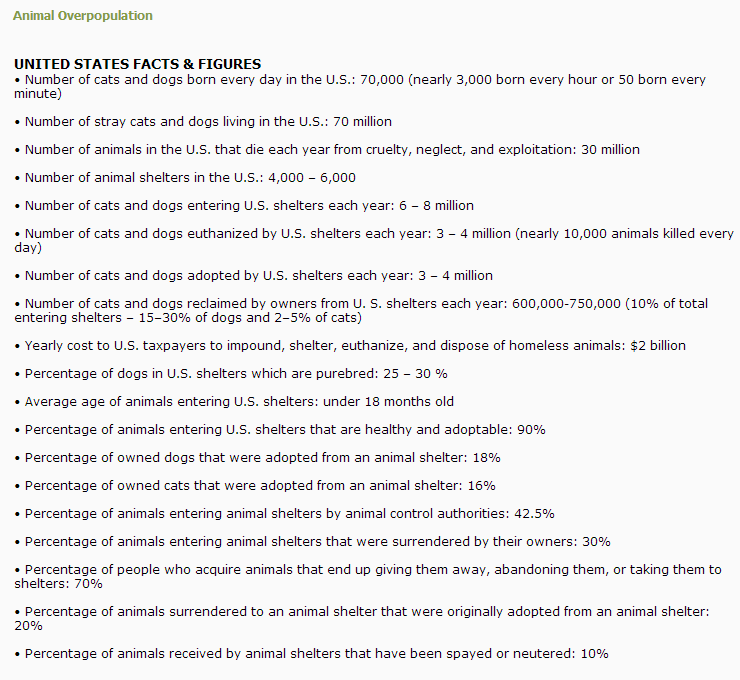 So, still think there’s no domestic animal overpopulation problem? Okay, keep your blinders in place while I talk about how we got here. People refuse to have their family pet fixed because it’s “too expensive” or they feel “junior needs to see the miracle of birth for himself.”(Really? Rent a video!) So their unfixed pets become procreative and suddenly there are six to ten more unwanted animals that will more than likely end up in the rescue system. Society somehow has gotten this idea that animals are disposable, like old couches or shoes. When we no longer want them we just drop them off at a shelter (the same way we drop our used clothes at the thrift store) and head on out and get a brand spanking new model. They do not see that dropping off their senior pet or pet with issues at a shelter is adding to the problem. Add to that the number of unwanted litters dropped off at shelters by people who thought spay/neuter was too expensive, or who are now done with the “miracle of birth” but do not want to take responsibility for the product of that birth, and you have an overpopulation problem. But it doesn’t end there. People dropping of pets at shelters is a big part of the problem, but it is just the tip of the iceberg. Think about the strays, those animals turned out of loving homes because they “came up” pregnant, or because they developed behavior issues. Add them to the mix and the problem grows exponentially. Okay, okay! I hear you screaming about your rights and freedoms, and if we were talking about going shopping for shoes I might agree, but we aren’t, we are discussing the causes of and possible solutions to a major crisis. With millions of companion animals being euthanized each year in the US alone surely we can no longer afford ourselves the luxury of turning a blind eye and pretending the problem doesn’t exist. The only ones who can solve this problem society has created, are society themselves.